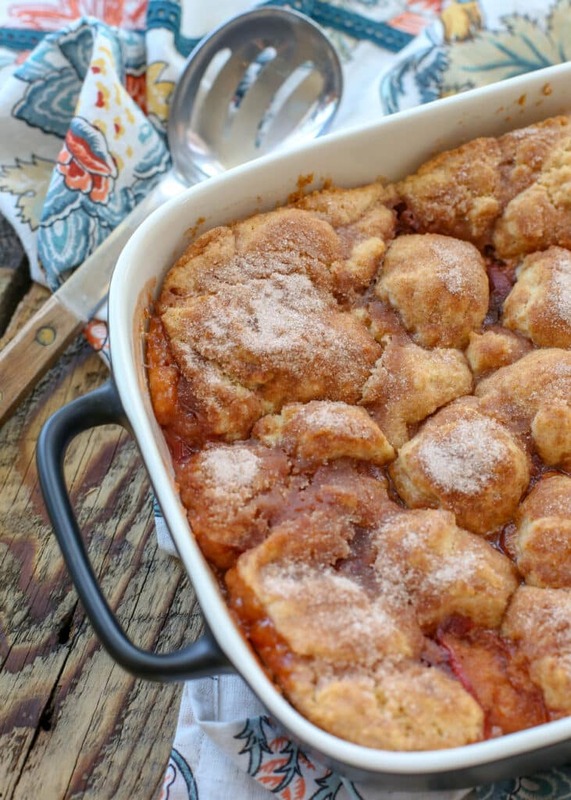 Almost ten years ago, I made it my mission to find the perfect southern peach cobbler recipe. I tried several that weren’t bad at all, but I wanted a truly perfect one. Peaches are my favorite fruit and peach cobbler rates pretty close to heaven in my book. This cobbler is filled with fresh juicy peaches and then topped with a generous cinnamon sugar crust that manages to be both buttery and flaky while never becoming soggy, even after a day or two in the refrigerator. It was a hardship, but we ate a LOT of homemade peach cobblers that summer. I think I played with a new cobbler recipe every week for at least 2 or 3 months. When I finally found this recipe, I made it several times in a row, before putting a huge star on it and saving it in my recipe binder. While I adore a warm fruit cobbler with cold vanilla ice cream, this cobbler truly stands on its own as well. Sweet and juicy with plenty of real peach flavor and just the right touch of cinnamon, this cobbler is the last homemade peach cobbler recipe you’ll ever need. I’ve made this recipe countless times and this peach cobbler is simply perfect. I’m updating the recipe I first shared on the blog over 3 years ago with the frequently requested gluten-free substitutions. With fresh peaches at my fingertips once again, I can’t get enough of this cobbler. 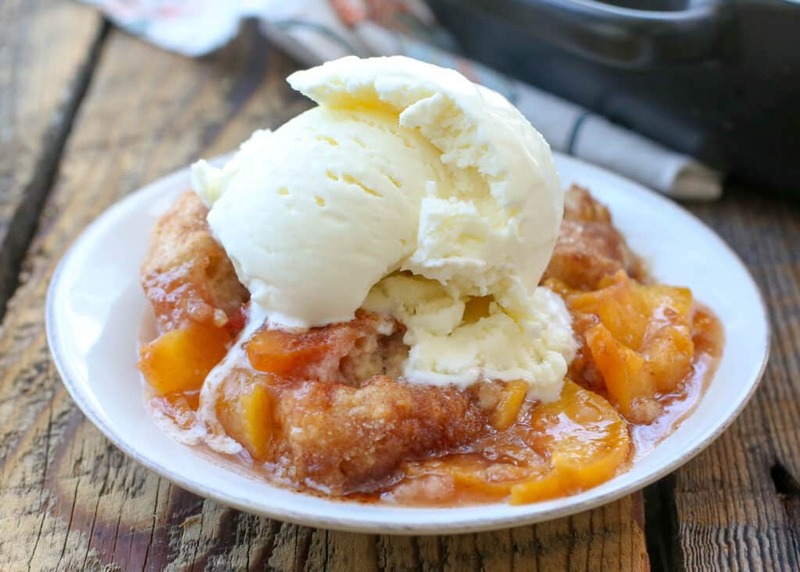 I made peach cobbler twice this past weekend, at our guests’ request, along with several batches of the best and easiest Homemade Ice Cream and it is sure to be made again while the peaches are still in season. Can you have too many fruit cobblers? In the perfect combination of fresh peach cobbler and homemade ice cream, you’ll want to set aside some cobbler for the most incredible ice cream ever, Peach Cobbler Ice Cream. Or better yet, double the recipe now to make sure you have plenty leftover. Peach cobbler from scratch isn’t too difficult to make. Unlike a pie, there’s no finicky crust to roll out or mess with and all it takes is a few steps. Peach cobbler starts by combining sliced fresh peaches with lemon juice, brown and white sugar, and tapioca starch (or cornstarch) along with cinnamon and nutmeg. While the cobbler filling baked, combine the ingredients for the crust topping. The crust topping in this recipe is absolutely perfect. In addition to grating cold fresh butter into flour to create the crumb texture I love in cobbler, just a touch of boiling water helps the whole thing attain a crusty texture as it bakes. A simple cinnamon sugar combination is added to the top of the cobbler crust. This cinnamon sugar topping adds a little crisp to the cobbler that’s so satisfying to bite into. Homemade Peach Cobbler is a classic summer dessert but I love it too much to limit my cobbler consumption to three months of the year. I try to freeze a few cobblers worth of peaches each year, so we can enjoy this fresh taste of summer year round. 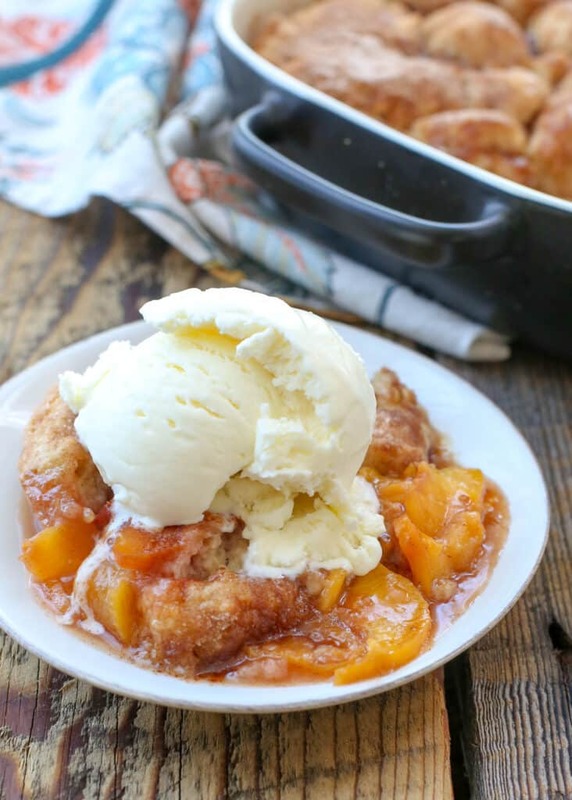 To freeze peaches for cobbler, combine the filling ingredients: peaches, sugar, brown sugar, cinnamon, nutmeg, and cornstarch in a gallon size zipclose freezer bag. Add the lemon juice to the peach mixture and stir to combine. Alternatively, you can seal the bag and shake gently to coat the peaches. Place the bag flat in the freezer. I like to prepare and stack several bags of the cobbler filling in the freezer each peach season. When you’re ready to bake the cobbler, thaw the peaches in the refrigerator. Pour the peaches and all liquid from the bag into the baking pan. Bake the fruit and proceed with the recipe as written. This method of freezing the peaches in advance means it’s even easier to have a cobbler fresh from the oven any time a craving for a perfect peach dessert strikes. It’s also a perfect way to use up leftover peaches aside from the standard canning and preserving methods. One of my other favorite things about this peach cobbler aside from the delicious flavor and taste is how well it holds up in the fridge. I’ve stored the finished cobbler covered tightly in the fridge for up to three days and found it didn’t get soggy. This Summer Pound Cake with Peaches and Almond Glaze is a showstopper. When this pound cake is in the house, you can bet that I’ll be eating a slice every chance I get. Baked Peaches and Raspberries with Lemon Curd is a delicious treat when topped with Whipped Cream or served on its own. How about a pan of these Peach Oatmeal Bars by BakerMama? I bet they’d be even more amazing with a scoop of Honey Roasted Peach Frozen Yogurt on top. Not in the mood to turn on the oven? Try grilling fresh peaches. The result is a rich, sweet, almost caramelized peach flavor reminiscent of the cobbler filling without any of the effort. Craving peaches for breakfast? I’ve got you covered with this Peaches and Cream Oatmeal and the much-loved Peaches and Cream French Toast Casserole. There aren’t many things I love more than blueberries and peaches, so this Blueberry Peach Bread by Big Bear’s Wife is calling my name. Wouldn’t that bread be great with a cup of coffee in the morning? And speaking of things that would be great with a cup of coffee, these Almond Peach Scones by Saving Room For Dessert would be divine in the morning or as a late afternoon snack. That’s not to say that you can’t have Peach Cobbler for breakfast. Because I often do and I highly recommend it. Using a cheese-grater to “grate” cold butter is my favorite hassle-free wait to cut in the butter. It takes just a moment and I think it’s simpler than the more traditional methods. If you choose not to use the grater, simply cut the cold butter into small pieces and then blend it into the flour mixture, using a pastry blender or your fingertips. It is entirely up to you whether or not you choose to peel the peaches for this cobbler. For years, I took the time to peel the peaches and loved the recipe like mad. About a year ago, I stopped peeling the peaches and I’ve never looked back. Peach skin is soft enough that it almost melts into the peaches as they bake. I can hardly tell a difference and I doubt I’ll ever again peel the peaches for a dessert. Anything that saves me a few minutes of preparation time on my way to enjoying my favorite dessert is a win as far as I’m concerned. 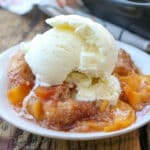 This southern peach cobbler is equally good served with a cold scoop of vanilla ice cream, fresh made Vanilla Bean Whipped Cream or all on its own. My family loves when I bring this dessert out of the kitchen at the end of the meal and it’s also a hit at parties, potlucks and special occasions of all kinds. Just a warning: if you get a reputation for having fresh peach cobbler in your kitchen you might find that friends start unexpectedly popping over for a bowl full of cobbler and a cup of coffee. In a large bowl, combine the peaches and the lemon juice and then add the rest of the filling ingredients. Stir to coat and then pour into a 9×13 baking dish. Bake the peach mixture in the preheated oven for 10 minutes. While the peaches are baking, combine the dry topping ingredients and whisk to combine. Toss the grated butter in the flour mixture. Stir in the boiling water, just until combined, leaving plenty of little lumps of butter. Sprinkle the cobbler topping with the cinnamon sugar topping. Bake until the crust is golden and a toothpick inserted into the crust comes out clean, about 28 minutes. Serve warm or at room temperature. The peach filling can be prepared and frozen in advance. I have frozen it for up to a year without any problems. Combine the peach filling ingredients in a large zip close bag, press the air out and freeze flat. When you are ready to bake the cobbler, thaw in the refrigerator and then pour into the baking dish and proceed with the recipe. It LOOKS like the perfect peach cobbler, that is for sure!! I don't know why, but peach is one fruit I don't eat much of, also don't cook with much. This will have to change, as I am really liking the look of your cobbler. Growing up in Texas, peach cobbler was the go to dessert when we went out to dinner. Your cobbler sounds terrific. I can't wait until peach season arrives in New England and I can try your recipe. Yum! I LOVE cobblers! I will pin this for when our peaches come into season....I wonder how a Strawberry cobbler would taste!! or a Strawberry and rhubarb cobbler!! This certainly is an amazing cobbler! We love it. Do you have any more? We could take it off your hands. YUM! I really can't think of any dessert that says summer to me more than Peach Cobbler. I have searched out the "perfect" cobbler too just to find myself unsatisfied. So now I am more than intrigued by your winning recipe. I just had the best cobbler the other day...but I like the brown sugar in yours. Delicious cobbler, I will keep it for later use too :)! 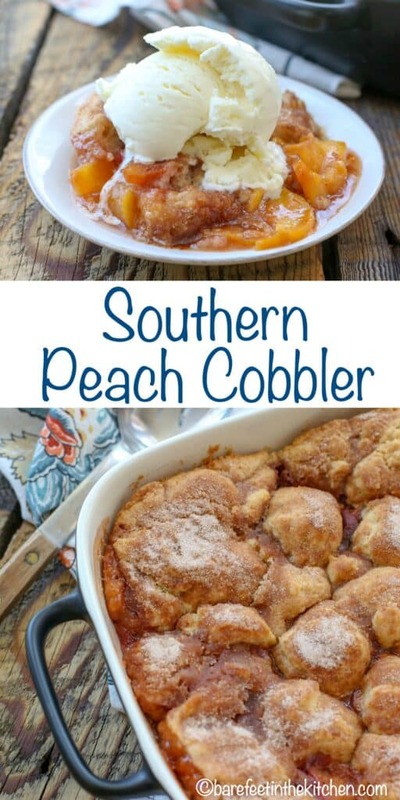 I love peach cobbler so much, and have also done a lot of experimentation trying to "perfect" it - can't wait to try this one when I get my hands on some fresh peaches! I haven't had peach cobbler in years! This looks so cute and delicious. I'm makin' it. Thanks for your constant inspiration. Have a great day, Mary. Sounds way too yummy! Pies, I don't get too excited about. Whereas, cobblers, well, that is something else! Do you have any other cobbler recipes? Love your site! could you make this with canned peaches by any chance or frozen peaches. I haven't tried frozen, but canned peaches will work. Enjoy! Frozen peaches are perfect. I left them in the oven an extra ten minutes before putting the topping on. Mary Younkin, this is an amazing recipe. I did add some rolled oats (1/2 cup) and flax (1/4 cup), and then upped the boiling water to 3/4 cup. I did this to slow down the blood sugar rise in our system. We aren't diabetic, but we do things like this so that we don't worry about it happening. So far (65 & 78 years old), it has worked for us. Boiling water - who knew??? The first word out of my southern friend's mouth is "Mmmmmmmmmm wow.... delicious....." And she's had many many good cobblers before. Thank you for sharing this wonderful recipe. Just one question: besides scooping the topping, what happens if I were to either layer or mix in with the peaches? Or can I spread it out on top instead for a different look? ~ Shayan J.
I'm sure the crust would work fine both of those ways as well. However, you'll lose a bit of that crispy cinnamon crust if you layer it with the peaches. I'm glad you liked it so much! This looks wonderful! Regarding freezing: do you usually just freeze the correct amount of peaches, or do you assemble the filling and then freeze it? I assemble the filling, pour it into a gallon size ziploc and press the air out of it. Then I freeze it flat. I hope that helps!